I would be happy to check out all your tools for tif files. Combine + split+ paging. A:One software can help you solve two problems of your question. 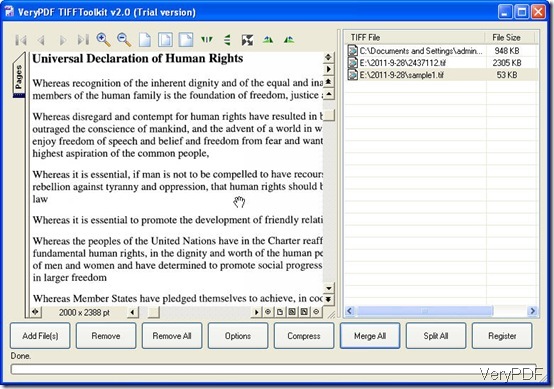 It is TIFF Toolkit which can help you merge and split tiff files. If you need, it also can help you compress the tiff files in five ways. But as to the paging function, up to now this software can not fulfill for you. If you need to it urgently, we can make one for you at additional cost. If you need to know more about this software, please visit its official homage. Now let us check how to merge and split tiff file. Download TIFF Toolkit to your PC and let it run. Add tiff files to it. Dragging and dropping will be OK or you can click button Add Files. Click one of the added files then it can be previewed in the preview Window. If you have added one or some by mistake, click the button Remove or Remove all to clear them. Click the button Merge All, then you will be reminded to choose a folder to save the merged file. When the progress bar back the status in the snapshot then you can check the merged file in the chosen folder. After merging, if you feel the size of the merged file is a little bit big, you can compress it by clicking the button Compress. Most of the steps for splitting tiff files are same as the merging, only the last one, you need to click the button Split All. 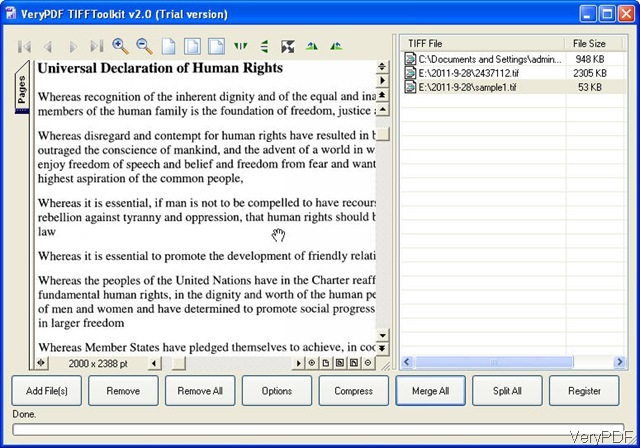 Then you can split files to pages. As to the compression method, let us have a check from the following snapshot. You can choose one of them, like LZW, zip, packbits G3 and G4(Group 4). When you click the button Setting , it is not hard to find another function. You can set the naming rule for the converted file. By this way, the converted file can be saved in order. If you need to know more software about file format conversion, please visit VeryPDF official website. During the using, if you have any question about our software or file format conversion, you are welcome to contact us by the ways supported on this website. Can I run TIFF Toolkit on a server to process the scanned TIFF files? This entry was posted in TIFF Toolkit and tagged merge, Tiff. Bookmark the permalink.